I hope I’m not ruining anyone’s day with this rumor. 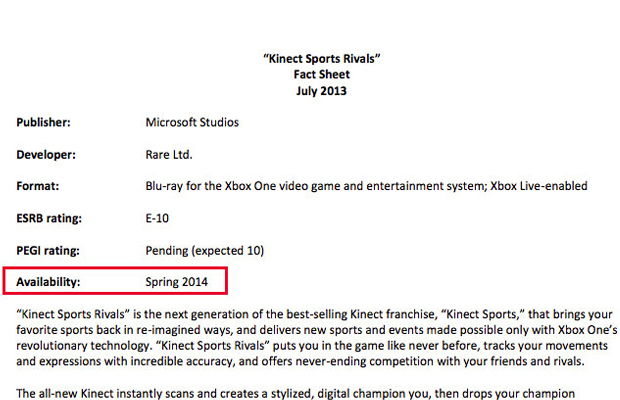 According to a thread on NeoGAF, Kinect Sports Rivals may no longer be a launch title for the Xbox One. A fact sheet dated this month, found by user wrog, describes the game in full and lists the game’s release target as “Spring 2014.” So much for the Day One 2013 branding. While it’s a shame that, if this rumor pans out, the Xbox One would miss out on another launch exclusive, is it really that bad in the long run? With Forza Motorsport 5, Ryse, and Dead Rising 3 complimenting the nice third party round up, are we really going to miss yet another mini-game collection? Those of you who preordered an Xbox One, are you going to miss yet another mini-game collection?